Almost too much music to be made by a quartet, but what a smokin' group! Led by talented German saxophonist, bass clarinetist, and composer Christof Knoche, this New York-based pianoless foursome stays slippery, groove-grounded, and razor-sharp on tunes that blur the line between composition and improvisation. Knoche listened to and jammed with classic rural blues and American pop records as a boy in Germany and later worked extensively on the World Music festival scene with singers from Tuva, Mongolia, and Russian, Egyptian violinists, and African drummers. He poured those diverse experiences into a palpably colorful set of originals, executed by top-flight New York "downtown" improvisers, including jazz trumpet's next big thing, Russ Johnson. Prepare to be Knochenized! 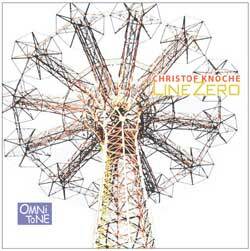 All compositions by Christof Knoche. Bob Bowen III, bass · Dan Weiss · drums. Recorded on 17 June 1999 at Maggie's Farm.